An easy way for an ecommerce store to improve customer retention is to provide a better post-purchase experience. If you improve the experience for customers after they purchase your product, it increases the likelihood that they will purchase from you again. 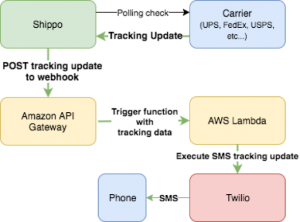 One solution is to connect Shippo’s shipment tracking webhooks with Twilio’s SMS API. In this way, we can track notifications that are sent to a customer whenever there is an update to an order’s status while it’s in transit. We also want to know how many people are opting in to receive notifications, and how often we might need to send those notifications. Here is where AWS Lambda and Amazon API Gateway can really shine. Using those AWS services helps us to avoid the tedious work of creating a system to dynamically allocate sufficient resources to manage user load. We can scale as needed, and we can also use serverless pay-per-use Lambda functions so that we don’t have to pay for infrastructure. To make everything even easier, we use a deployment automation tool called ClaudiaJS (more on that later) to do most of the heavy lifting for us. In this post, I walk you through a sample project that uses a Twilio API and a Shippo API to create a service that automatically sends SMS shipment tracking updates. Twilio provides the ability to send the SMS messages, while Shippo pushes the tracking updates to our API Gateway webhook URL. The following diagram shows how this works (the green path is the data flow). Twilio account – You need your account SID and auth token from the account (you can find both in your dashboard after signing up). Shippo account – You just need to plug in your API endpoint URL to the webhooks area to have it work. Node.js 4.3.2 – The functions run on NodeJS in AWS. ClaudiaJS – You use this tool to automate the deployment process. Claudia needs access to your AWS account. For information about setting up access credentials for ClaudiaJS so that you can create Lambda functions and API endpoints, see Installing and Configuring ClaudiaJS. AWSLambdaFullAccess – Required for all Claudia deployments. IAMFullAccess – Required if you want Claudia to automatically create execution roles for your Lambda function (recommended for beginners). If you can’t use this role because of corporate policies, or if you don’t want to grant Claudia access to the AWS IAM service, then you can create a Lambda execution role manually and pass the name --role <ROLE NAME> using when executing claudia create. AmazonAPIGatewayAdministrator – Required if you want to use Claudia API Builder or Claudia Bot Builder, or if you want to deploy the API Gateway Proxy APIs. The end goal is to get something like what we have at app.js in the repo. Feel free to simply copy and modify from there, or use the next set of instructions in this tutorial to deploy using ClaudiaJS. From here, create the API endpoint that you will put into Shippo’s webhook interface for capturing all of your tracking updates. Every time Shippo detects a new update to the status of a tracking number that you have POSTed to them, Shippo will send updates to your endpoint. You must export your function so that Claudia can package everything up to be deployed to AWS for you. You can continue with the following in your app.js file:You are creating a POST endpoint because Shippo will be POSTing the tracking updates to you. You then parse the data to relay over to Twilio to send out your SMS messages. You are creating a POST endpoint because Shippo will be POSTing the tracking updates to you. You then parse the data to relay over to Twilio to send out your SMS messages. Now that we have our logic built for handling the body of the response and can safely handle when we don’t get a location with our tracking status, we can dig into sending a formatted SMS using Twilio. The basic format for sending Twilio messages requires that we have a destination number (to send our SMS to), our Twilio number that we’re sending from, and a message to send (duh!). In the preceding code, note that we use a Promise to resolve the function. We do this because ClaudiaJS looks for whether you’re using a Promise in your Lambda function, and then lets it continue to run until the Promise resolves (or your function times out, which is around 3 seconds by default in AWS). There are some scripts in package.json named create and update that can be useful when you’re crafting your Lambda function. Next, ClaudiaJS will package and deploy the Lambda function that you’ve created and also will create an Amazon API Gateway endpoint. The Amazon API Gateway endpoint is tied to your function to execute whenever a request is received. At the completion of your deployment, ClaudiaJS will provide a URL that points to the API Gateway endpoint. Paste this into the URL field in Shippo, make sure that the dropdown under Event Type is set to tracking, and then choose the green check box to save it. Now you can test the function by choosing test on the right. If everything goes well, you should receive an SMS with tracking information at the number you had in the to field of your Twilio sendMessage object. Now you can get SMS updates for all the numbers that you post to Shippo automatically without having to provision any servers, and you pay only when you receive updates using AWS Lambda and Amazon API Gateway with AWS. You could take it a step further by including phone numbers for SMS updates in the metadata field when POSTing to Shippo, and you could parse that out to dynamically send SMS updates to customers. For more information about Shippo and how to use their shipping API to improve your shipping experience, see https://goshippo.com/docs.